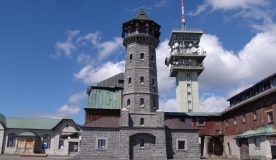 Watch live footage from the webcams placed in the lookout tower on Klínovec. Thanks to two rotating cameras you get a complete view of the landscape. Data about the temperature are provided by Czech Hydrometeorological Agency (ČHMU).